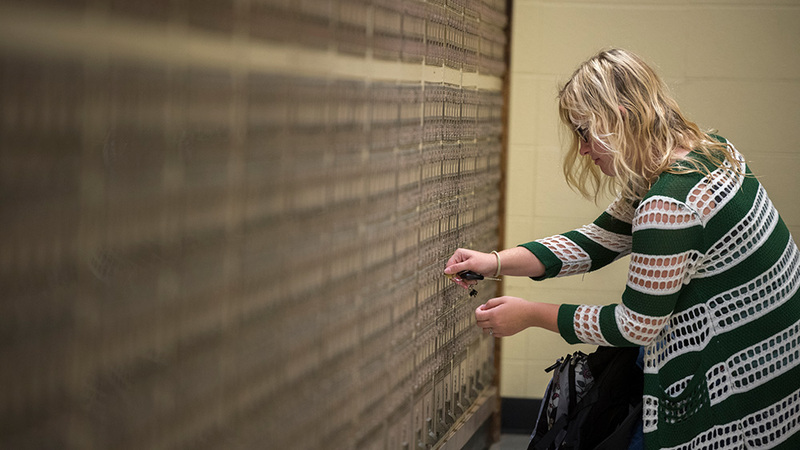 Campus housing residents will each have an individual mailbox. Mailboxes are available, upon request, for students who reside off campus and are enrolled in at least six credit hours. Each person's mailbox number will remain the same for as long as they are continuously enrolled. Mailboxes are provided for the individual student's personal use only, not for other family members, friends, business purposes, etc. An OBU identification card or a driver's license is required in order to obtain a mailbox key and to pick up packages or other mail. Mailbox keys must be returned to the Mail Room upon completion of or withdrawal from school. There will be a $25.00 non-refundable fee assessed for keys not returned. A $25.00 replacement fee will be charged for a lost key. The fee may be refundable if the key is found and returned to the Mail Room before a replacement key has been made. Due to the large amount of mail being handled by the Mail Room, the necessity of having one's key when picking up mail is crucial. A $1.00 fee will be charged for Mail Room personnel to get mail from your mailbox up to maximum of three times a semester. After that, the $25 replacement fee will be charged to replace the key. Campus mail is posted at intervals throughout the day. Mail for campus distribution should include the addressee's name and mailbox number, as well as the sender's return address. Postage stamps are not required for items distributed through campus mail. Minimum size for campus distribution is 3" x 5". Mailings of ten or more pieces should be in numerical order according to mailbox numbers and rubber banded together. The last pick up from the campus mail drop is at 4:30 p.m. Monday through Friday and 11:30 a.m. Saturday. The United States Postal Service mail is delivered once a day, normally in the morning. Mail that is addressed correctly is usually posted by early to mid-afternoon. Mail that is not addressed correctly requires additional time for posting. United Parcel Service daily delivery time varies but is usually mid to late morning. Federal Express and other carriers deliver at various times, depending on the type of service requested by the shipper. A notice will be placed in your mailbox advising you of items received that are too large to fit into your mailbox or that require a signature for delivery. Please check your mailbox for notices instead of contacting the Mail Room to inquire about packages, etc. The last pick up from the mail drop is at 3:45 p.m. Monday through Friday. Postage stamps for letters and post cards may be purchased at the Mail Room. Personal items weighing less than 13 ounces may be mailed through the Mail Room. Personal items weighing 13 ounces or more must be taken to the UPS Store across the street from campus, 2700 N. Kickapoo; to the Contract Postal Unit located at Shawnee Tax and Accounting Service, 303 W. MacArthur; or to the Shawnee Post Office, 116 E. 9th. The UPS Store also offers outgoing shipping services.